It’s been all I have known since birth, a passion that has grown over the years mixed in with a lot of heartache and occasional celebrations. But that has been the Collingwood life for the most part, growing up in Tasmania all I have known is football. Local and AFL football has been what I have followed and what I’ve been taught, I’ve heard most of the history of the club from my family. At six years old I saw the club break through after 32 years to hold the premiership cup aloft, it’s a day I will never forget. In 2010 I was 26, older and wiser and able to celebrate the day more knowing that after so long the club finally got that elusive premiership that we tried so hard to get in 2002 and 2003. My memories of that one Saturday in October 1990 are vivid as if it was yesterday, a long week preparing for my first AFL Grand Final featuring Collingwood. After hearing the history of Collingwood and Grand Finals it was a nervous day sitting in front of that TV at home, I just wanted the day to be over and Collingwood as premiers would have been ideal. 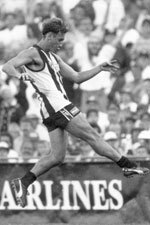 My hero of the day back then was Peter Daicos and locally it was Shane Fell, the dream was to grow up and be a full forward like them, my first jumper presentation all I wanted was Shane Fell’s 16, a friend got it. 35 had been handed out already as well, but Grand Final Day at Half Time I’d grab my football run outside and kick it around. The parents nervously awaiting a big second half, worrying if the Collywobbles that plagued the side for so long would resurface. I didn’t care for it back then, all I wanted to do was kick my football around the backyard kicking goals like my idols. The time had come for the second half I ran back inside and watched the rest of the game and celebrated at last a Collingwood Premiership, as an adult now that past routine wasn’t part of my Grand Final Day. As the years went by I would recreate moments of the games I’d play, and when my career came to an end it would be the recreating of AFL games. I’d still grab the footy and run outside dreaming that I was still wearing the famous black and white, pulling out a mighty torpedo every chance I’d get. Finals defeat came hard for me growing up, when the Eagles beat Collingwood in that final the tears flowed for the first time I had known what it was like to see the Pies lose a final. At 18 and 19 watching Collingwood losing Grand Finals did not come any easier but tears were held back for those games. Through the 1990s I’d wear my Collingwood stuff proudly, even if I’d get ridiculed by the Carlton, North Melbourne or Richmond fans that I grew up around. One such time I was at the local shop, and a Carlton supporter was giving me grief to which my dad told me not to worry about him he was probably jealous. I was a proud Magpie and I’d always wear my jacket and take my flag to Glenorchy games, while there I’d listen to the game on the radio not all games were live back then. Tasmania got more live games and they competed with the local game, but routine was always going to see Glenorchy at home or watching them on TV away. Collingwood held a place in my heart still for parts it was a second place, as I was able to see them live almost every week and the games were on the TV. It wasn’t until my uncle passed away in 1996 that part of the local footy passion had left me. My last memory was just after the second Anzac Day game, he arrived at what would become my new house and like my dad try and make up a story. He had told me the Pies had been stripped of the points of that game, and was very convincing much like his brother my dad. Mum is also a passionate Collingwood supporter, in the early 90′s her and dad had found the Hobart Collingwood Supporters Group run by a friends dad we became members. In 2014 the dream is to see Collingwood live in person, and experience what dad experienced back in the 1970s when he got to see Collingwood and Geelong. He told the story of Peter McKenna that day, and how the atmosphere was that day since then he hasn’t been to another game. As I grow older the passion slowly grows a little more inside, as a school boy it was only a game now it’s way more important than that. I look forward to many more years supporting Collingwood, and hope that the wait for another premiership is not as long as the last two.